West Bangalore areas like Vijayanagar and Yashwanthpura can get showers too. The SE winds in the Eastern Sector (Bay) have now picked up, and are rushing towards the equator. As predicted, after 1st May, the fairly strong MJO phase moves Eastwards, and fortunately gains in strength. Consequently, the ICTZ (the Eastern part), has hastened its Northward movement, and aligned itself with the Equator on the 2nd of May. The winds are moisture laden and rushing from the SW into the Southern most Bay off Sumatra. The formation of a Low ( BB-1) in the Southern Bay is possible around the 7th of May. Low is initially likely to strengthen a bit and move from off the Eastern Coast of Sri Lanka in a NE direction. This pre Monsoon Low (when formed) is long overdue. I notice the Jet Streams at 200 hpa also ready to take a distinctive Easterly turn early next week. If it coincides with the formation of the low, monitoring the low will be interesting. The Southern Hemisphere Low has moved W/SW. It is keeping the ITCZ at 5S in the Western Sector. Friday heavy showers likely in Interior Karnataka and Kerala. Bangalore can get the thundershower. Regions West of Bangalore to get heavy showers on Friday..
NE states will be again in for thundershowers. Shall put up the weekend forecast on Friday.. Thanks Rajesh sir. Good to hear. Hope to god we get the much delayed rains. 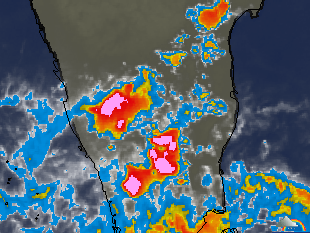 TS cells developing North and East of bangalore. Good chance of rain. Hope the TS does not slip south of the city. City is burning hot. Only decent rains can make it bearable. As feared clouds have slid south of bangalore. Appears like its raining heavily in krisnagiri , dharmapuri and kanakapura. As per current forecasts, this low is expected to strengthen into Cyclone Mahasen.